Don’t tell our bosses, but ever since we lived the cinematic experience that is Black Panther over its opening weekend, we’ve been having trouble keeping ourselves mentally at our cubicles when we know the Kingdom of Wakanda is waiting for us back at the movie theater. And we *know* we aren’t alone in our Black Panther obsession. Ryan Coogler’s massive blockbuster is smashing box office records — it’s already earned $426.6 million globally — and sparking long-overdue cultural conversations about representation, black identity, and the future of superhero franchises. Let’s just say, if you haven’t seen it yet, get on that ASAP (and stop reading now, lest you rob yourself of the joy of enjoying it all with fresh eyes and ears). 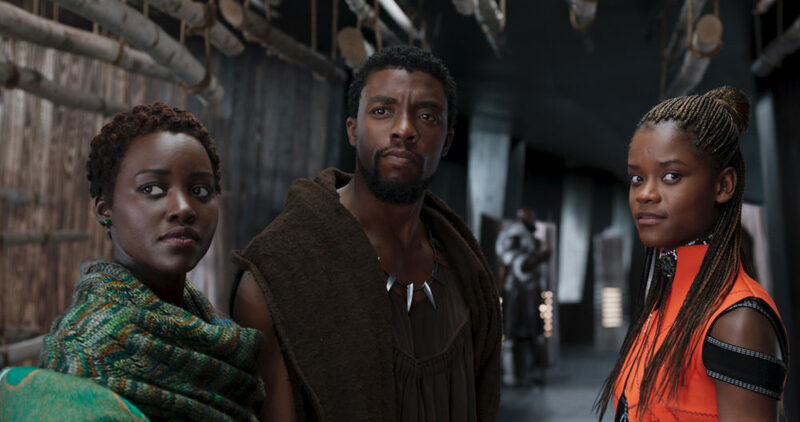 And if you have seen it, but you’re also stuck at your silly ‘ol desk instead of immersed in the majestic cliffs and whirring technological advances of T’Challa’s homeland, we’ve put together a list of some of our favorite quotes and moments from Black Panther that are giving us more life than vibranium — and will hold us over until we can go see it again. And again. And again. Even superheroes sometimes need some words of encouragement from their moms. Queen Ramonda (Angela Bassett) gives T’Challa (Chadwick Boseman) just the confidence boost he needs with this line. One of the many striking things about Black Panther is seeing a white male character like Martin Freeman’s Agent Everett Ross playing a secondary role that serves to advance the black characters’ story, when black actors are often relegated to those supporting parts. Freeman kills it as an American CIA operative who illustrates just how much the outside world underestimates Wakanda and its people when he drops this line. T’Challa’s sister and Wakanda’s resident tech princess (literally), Shuri (Letitia Wright), definitely delivers some of the movie’s sickest burns and funniest observations, while also rocking some of the most beautiful futuristic-meets-iconic costumes. We’re not shocked that some of them weren’t super comfortable, and that she was the one to call attention to that. Building on the old superhero message of great power bringing great responsibility, this sage wisdom from T’Challa’s father King T’Chaka plays out in the tough decisions T’Challa is faced with as Black Panther. Shuri calling out her brother’s funky shoes is both relatable AF and an A+ meme joke. This whole scene, from the sleek exclusive Korean club where the action goes down to Okoye’s kickass and empowering as hell fight sequence, is eye-popping in its coolness. Agent Ross injects some mood-lightening humor with this mocking dig at Ulysses Klaue (Andy Serkis). Shuri’s speaking volumes here as she’s breaking down her latest technological developments to T’Challa and there’s, of course, a lot to read into beyond his suit. While Killmonger (Michael B. Jordan) may be the “villain,” he offers up some insightful commentary throughout the movie, like this stinging line at the end. Yes, the movie is technically named after T’Challa, but the movie makes clear almost immediately that it’s the squad of powerful women that makes Wakanda really thrive. Whether it’s Okoye taking down armies of attackers with her spear, Shuri creating a power-transferring super suit for her brother, or Nakia putting T’Challa in his place with this empowering statement, the ladies make a lasting impact. Now, what world leader determined to build walls, er, barriers, could T’Challa be referring to with this smart line from one of the movie’s two post-credit scenes? Someone give Shuri her own comedy special, like, yesterday. We’ve said it once, we’ll say it again: Wakanda forever and ever.